Challenge your group to neutralize targets and resolve hostile situations in the most unique team building experience in Orange County. 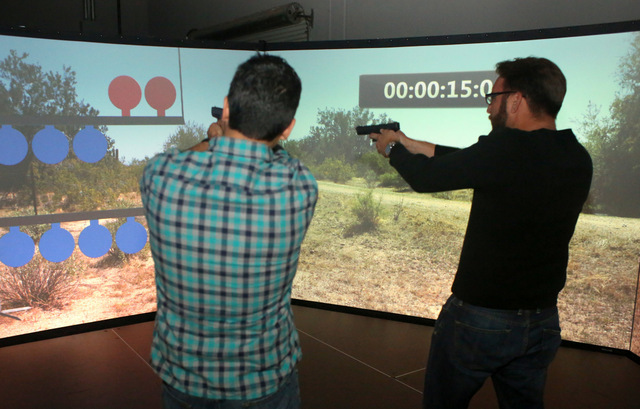 We’ll put your team through a series of fully interactive weapons simulators led by experts in the field. We’ll conclude the session with the ultimate Top Gun shootout because there can be only ONE. Want more? We can add practical hand-to-hand combat instruction, team challenges, and Knife Fight/Defense instruction as additional skills stations. The entire experience is unique to Orange County and we’re the ONLY ones offering it to civilians. We will elevate your heart rate and adrenaline levels and force you to think and make sound decisions under stress. Techniques like combat breathing and the five count presentation will allow you to excel under stress. The parallel to the business world is an easy line to draw. Professional Tactical Instruction Staff, Self Defense Instructor, 3 Skills Stations, Top shot competition, Individual Team Performance Insights, Incorporation of Company values, Performance Debriefs, Hand Gun Instruction, bottled water, Facility Rental, Engraved Medals for Top Shot and space for refreshments.